A dental implant is the structural part of a tooth replacement treatment. It forms the base for placing a crown. And because of that, it is very important that the implant is correctly placed. With accurate placement an implant will securely hold a crown and perfectly blend in with the rest of your smile. One of the most important parts of this type of treatment is the planning phase, in which Dr. Peterson will develop a placement strategy to insure the implant is correctly placed. River Crossing uses an advanced ultra-modern method of computer modeling to aid in this crucial process. The process starts with Dr. Peterson taking a 3D X-ray of your jaw using a specialized panoramic scanner which creates a very detailed complete profile of your maxillofacial structure focusing on the mandible. This image is then uploaded into a computer system and will assist Dr. Peterson in the mapping and placement of the dental implant post. Once the implant placement has been optimized for your treatment and a surgical plan prepared, Dr. Peterson will create an acrylic guide that will fit over the surrounding teeth and assist in targeting the correct location where the implant will be located. The next step is the installation of the implant. During the visit Dr. Peterson will surgically embed the post of the implant into the jaw bone. Before the crown can be secured to the implant you will need about 3 months of healing time to allow the bone and surrounding tissue to fully recover from the surgery. During this time the bone will begin to fuse with the implant post in a process called osseointegration. This is an important stage of your healing and is part of what make a dental implant so secure. 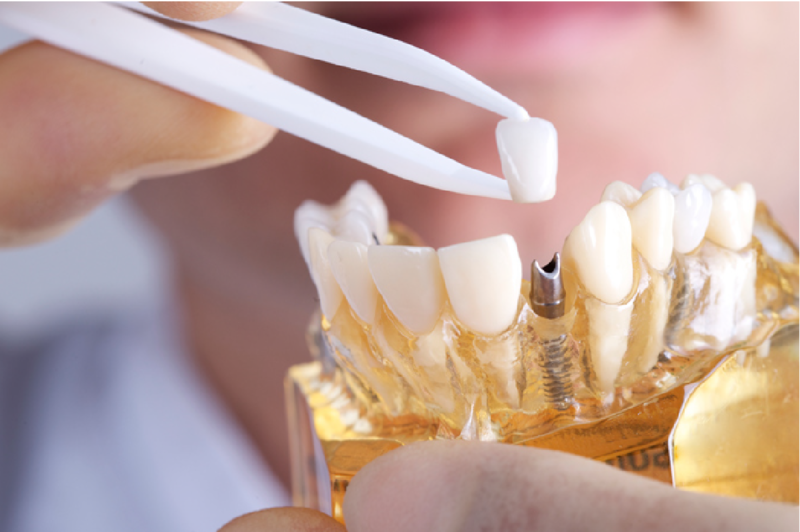 The last step in the process is placing the crown and completing the restoration of your smile. During this visit Dr. Peterson will attach an abutment to the top of the post. The abutment provides a connection point on which the crown will be placed. Using the most up to date modern technology River Crossing will insure your smile restoration will be perfect and complete. You’ll love it and everyone else will love your smile.